Ignore last week's performance against the Bills. That was a last gasp stand by a proud defense (and the two Patriots scores were rushing.) Pay more attention to what happened the weekend before that. That's when Tom Brady threw 4 touchdowns against this same Miami defense. Brady is a must start every week regardless as he sports the highest floor and ceiling of any quarterback. But against a team allowing almost two passing touchdowns a week, he's a lock. The only blemish on a very sunny matchup is the one game suspension that Rob Gronkowski will be serving. Expect great things under the lights ofMondaynight. On the verge of being benched, Alex Smith responded in a big way with one of the highest fantasy outputs of the season. In week 14, he gets a dream matchup against a scuffling Oakland defense. The Raiders are allowing the second most points per drive and have no pass rush (only 22 sacks on the year.) Also look for Travis Kelce to have a field day with Oakland allowing the 7th most fantasy points to the tight end position. Considering Smith has already posted a 25 point day against this same defense, he makes for a solid choice this week. Matthew Stafford has to be included in this quarterback to target list even though he is currently questionable with a Terrelle Suggs-flattened hand. Stafford has been one of the most consistent quarterbacks in fantasy and faces a juicy matchup against a subpar Tampa Bay secondary. While the defense has been playing better of late by limiting red zone scores, they are still surrendering large chunks of yardage. Even with their offensive line issues, the Lions, mainly through Golden Tate and Marvin Jones, have ample weapons to victimize the Bucs. Just make sure you follow the injury reports closely. 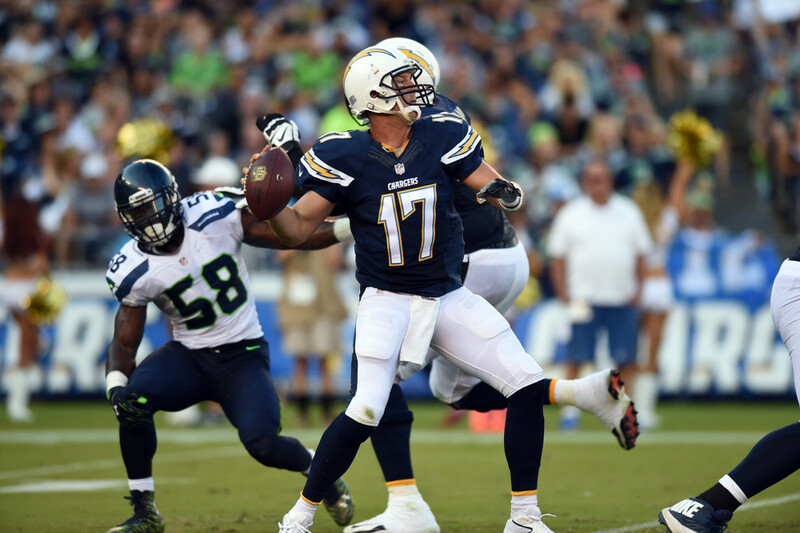 Philip Rivers is back in the target list, largely thanks to Keenan Allen, but don't tell him that. Allen is on an absurd 3 game stretch with 33 catches and over 400 yards and 4 touchdowns, and is lifting the entire offense with him. Hunter Henry has taken the next step and Travis Benjamin has seen more space to operate. The Washington Redskins secondary has been excellent against wide receivers, led by Josh Norman, but the Chargers' unit runs three deep and the Redskins are dreadful against tight ends. Rivers may have been on your bench for most of the season, but this a good week to plug him in. Carson Wentz is another quarterback that is unbenchable at this point. Even in a daunting matchup on the road against the Seahawks that saw Wentz's 7 game multi-TD streak end, he still managed to put up a serviceable 16.9 fantasy points. Week 14 presents another tough matchup against a Rams defense that is third in the league with 37 sacks and sports a top tier secondary. Still Wentz presents the second highest floor behind Brady, and should reward owners that continue to trust in his arm.